​The monthly meeting of the PADD Board of Directors was held at Baptist Health Madisonville (BHM). Baptist Health Madisonville President, Rob Ramey, welcomed guests and shared historical and current facility information stating they are making improvements to provide excellent rural health care services while facing economic challenges. The best way to succeed is to work collaboratively. PADD Treasurer, Denise Sutton, presented the Financial Report. Federal and State reports were provided by Rep. Jim Gooch, Rachel McCubbin (Paul), Amelia Wilson (Comer), Morgan Alvey (McConnell), Mark Welch (KYTC), and Marta Elliott (USDA). Staff reports were presented by Amy Frogue, Jill Collins, Sheila Clark and Molly Deahl. Ray Hagerman, President, Hopkins Co. EDC, shared successes in Hopkins Co. thanks to their partnership with PADD and shared information about two upcoming events. PADD Chairman Judge Donnie Carroll introduced guest speaker, Kim Humphrey, Director of Employee & Community Programs, Alliance Coal Company - River View Coal, shared information about the coal industry, its economic impact, and production facts. 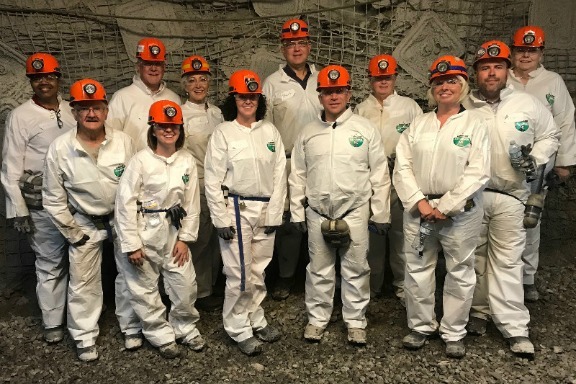 Jason Vincent, PADD Executive Director, reported several board members and guests had the opportunity to take a tour of Warrior Coal Mine prior to the board meeting and he expressed his appreciation to Kim Humphrey for coordinating the tour.